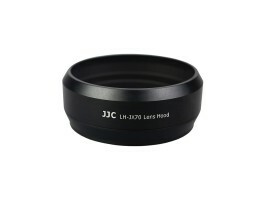 The lens hood LH-JX70 and the lens adapter ring are both made of aluminium. The lens adapter needs to be screwed on the lens ring of the Fuji X70. The lens hood can then be screwed on the lens adapter. With the lens adapter you will also be able to use 49 mm lens filters. The lens hood LH-JX70 can replace the original Fuji lens hood LH-X70.